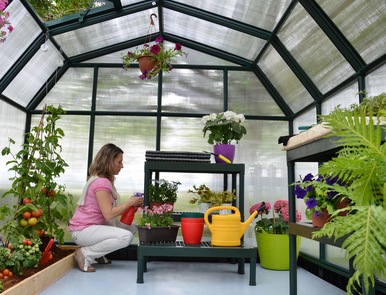 If you are feeling upset at the end of the gardening season every year and are considering extending your gardening enjoyment into autumn and winter; the Hobby greenhouse is a great choice. Let your plants and vegetables grow and keep them safe from the elements, so they will to thrive during winter season. 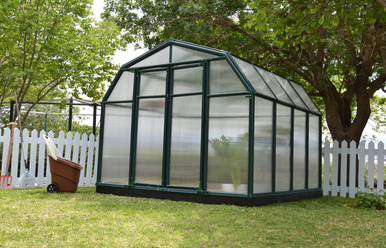 The Hobby Gardener 2 greenhouse, manufactured with 4mm twin-wall polycarbonate roof panels and 6mm twin-wall side panels, offers superior strength, safety, light diffusion and great heat insulation. The heavy-duty resin frame is fully UV protected and comes in a lovely green that will blend in beautifully with your outdoor space. 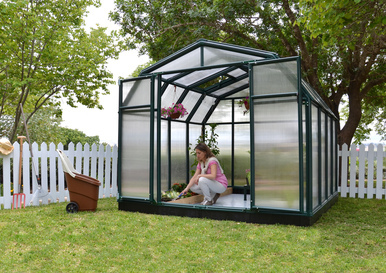 This greenhouse is 8' wide and is available in several lengths to fit your space and your needs. Can be easily assembled with the smart "Pin & Lock" connector method, which adds strength and makes assembly simple! Secure to concrete pad or heavy timber foundation. Optional base kit may be added for additional height and extra stability. See Drop Down window below for additional sizes! Double wide hinged doors for a comfortable working space and easy access. 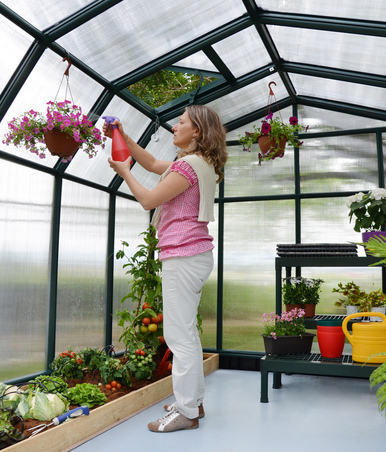 Click here to view Greenhouse Accessories.